On September 4, the seventh edition of the authoritative immunization textbook, Plotkin's Vaccines, won first prize in the public health category at the British Medical Association Awards. Portions of the Elsevier press release are reprinted below. Elsevier, the global information analytics business specializing in science and health, and its authors had a strong showing at the British Medical Association’s (BMA) annual BMA Medical Book Awards ceremony, winning nine of the 20 categories. 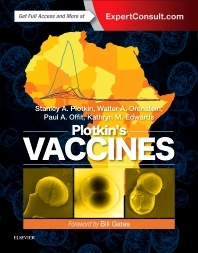 Described by Bill Gates as "an indispensable guide to the enhancement of the well-being of our world," Plotkin's Vaccines is a must-have reference for current, authoritative information in this fast-moving field. The authors are Stanley A. Plotkin, MD; Walter Orenstein, MD, DSc (HON); Paul A. Offit, MD, and Kathryn M. Edwards, MD. Access additional information from Elsevier about the book, including the table of contents and ordering information. IAC joins the entire immunization community in mourning the loss of Lynn Bozof, president and cofounder of the National Meningitis Association. Following the death of her son Evan at age 20 from meningococcal meningitis, Lynn became a tireless advocate for the use of meningococcal vaccines, working to make sure all parents were aware of their existence and their availability for children and teens. Lynn frequently attended meetings of the Advisory Committee on Immunization Practices (ACIP) in Atlanta to give public testimony, urging the committee to expand its recommendations for broader use of meningococcal vaccines. Lynn’s selfless commitment won her national recognition as a true champion for protecting lives through vaccination. It is with profound sadness that the National Meningitis Association announces the death of our President, Lynn Bozof. Lynn, who lost her son Evan to meningococcal meningitis, founded NMA with four other parents 16 years ago. Lynn died of pancreatic cancer on September 15 surrounded by her family. “Lynn was passionate about NMA’s mission to protect our children through meningococcal and other vaccines,” said Leslie Maier, Secretary/Treasurer of NMA. According to NMA Director Lori Buher, “Lynn worked tirelessly for NMA until just weeks before her death. She left NMA in a strong place and our Board and national network of advocates will continue to advance NMA and its mission in Lynn’s memory. The annual National Foundation for Infectious Diseases (NFID) Influenza and Pneumococcal Vaccination Kick-Off news conference will be held in Washington, DC, on September 27 at 10:00 a.m. (ET). At the event, a panel of experts will engage in discussions about the previous and upcoming flu seasons. To listen to this 1-hour press conference live, you must pre-register. 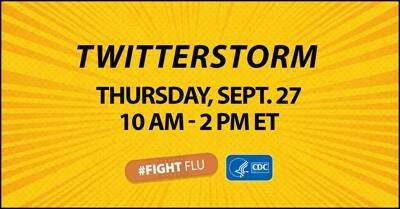 In addition, CDC and NFID are hosting a #FightFlu Twitterstorm on the same day between 10:00 a.m. and 2:00 p.m. (ET). Tweet messages about flu prevention and why you choose to vaccinate using the hashtag #FightFlu. Retweet messages posted by your peers: @CDCflu and @NFIDvaccines. Recently updated, IAC's Adult Vaccination web page on immunize.org is full of resources from IAC and its partner organizations to help you vaccinate adults this fall or any time! This web page is easy to find from anywhere on immunize.org. From the row of blue tabs across the top of every immunize.org web page, select the "Clinic Tools" tab (third from the left). Then select "Adult Vaccination" from the drop-down menu. In the left-hand column of the page, you will find IAC's educational tools related to adult immunization, including handouts for healthcare professionals and for patients, standing orders templates, and a link to all IAC Adult Vaccination education materials. In addition, in the right-hand column of the web page, you will find links to adult vaccination resources from IAC's partner organizations, including CDC, American College of Physicians, American College of Obstetricians and Gynecologists, American Academy of Family Physicians, National Adult and Influenza Immunization Summit, National Vaccine Program Office, and National Foundation for Infectious Diseases. In both columns, you will find prominent display boxes that link to IAC's 142-page book, Vaccinating Adults: A Step-by-Step Guide. Find all the resources and tools you need for adult immunization by visiting IAC's Adult Vaccination web page at www.immunize.org/adult-vaccination today! In light of the current shortage of recombinant zoster vaccine (Shingrix; GSK), CDC has prepared a statement for healthcare providers reminding them about considerations and the importance of the 2nd dose. The statement is reprinted below. Implement a vaccine reminder and recall system using phone, e-mail, or text messages to contact patients when you have Shingrix supply. Give first consideration to patients due for their second dose of Shingrix (https://www.thecommunityguide.org/findings/vaccination-programs-client-reminder-and-recall-systems). If you are out of Shingrix and a patient needs a second dose, refer the patient to another provider in the community (e.g., a pharmacy) that has Shingrix so the patient can complete the series. The immunization program at your state or local health department or vaccine finder can help identify other immunization providers (https://vaccinefinder.org). Be sure to enter your patients’ current vaccination information into your state’s immunization information system (IIS). This will ensure that every provider can access your patients’ immunization record, and it may help facilitate patient reminders to complete the Shingrix series. As supply becomes less constrained, be sure to notify eligible patients so they can come in to get their first dose of Shingrix. CDC issued Tetanus in Areas Affected by a Hurricane: Risk, Prevention, and Management Guidance for Clinicians in the September 21 issue of Clinician Outreach and Communication Activity (COCA) Now. Portions of the bulletin are reprinted below. IAC's Ask the Experts: Diphtheria, Tetanus, Pertussis and Ask the Experts: Haemophilus influenzae type b (Hib) web pages have been completely reviewed and updated by experts at CDC. Ask the Experts: Diphtheria, Tetanus, Pertussis: Revisions include the elimination of temperature of 105 degrees F as a precaution to receiving DTaP vaccine; these changes are consistent with Prevention of Pertussis, Tetanus, and Diphtheria with Vaccines in the United States: Recommendations of the Advisory Committee on Immunization Practices (ACIP) and the recently revised DTaP Vaccine Information Statement. Ask the Experts: Haemophilus influenzae type b (Hib): Revisions include the removal of a reference to products that are no longer distributed in the United States (e.g. Menhibrix), update of several URLs and references, and minor editorial revisions. There are now 681 organizations enrolled in IAC's Influenza Vaccination Honor Roll. The honor roll recognizes hospitals, medical practices, professional organizations, health departments, and government entities that have taken a stand for patient safety by implementing mandatory influenza vaccination policies for healthcare personnel. Since August 15, when IAC Express last reported on the Influenza Vaccination Honor Roll, six additional healthcare organizations have been enrolled. Beware of B is a national campaign to encourage Big Ten universities to require the meningitis B vaccination for incoming students. The campaign encourages you to take two minutes to watch this powerful video that brings to life the devastation of meningitis and the importance of getting vaccinated. Since 2011, 100 percent of the college outbreaks of meningitis have been the B strain. Due to the close quarters and conditions of coed life, college campuses continue to be a breeding ground for meningitis B. It is important that we come together to implore universities to take the necessary steps to protect their students. Big Ten universities Purdue University and Indiana University announced this spring that they require the meningitis B vaccination for all students. Beware of B has joined fellow health organizations around the country in a campaign to protect youth from this deadly disease. Help to raise awareness and encourage Big Ten universities, and all universities to #BewareofB. IAC recently revised Standing Orders for Administering Influenza Vaccine to Children and Teens to correct an age range in the instructions for administering influenza vaccine to children age 6 through 35 months. The text now reads: "...children age 12 through 35 months may receive injection in the deltoid muscle." The World Health Organization (WHO) published Cholera, 2017, and Performance of acute flaccid paralysis (AFP) surveillance and incidence of poliomyelitis, 2018, in the September 21 issue of its Weekly Epidemiological Record. A section of the cholera report is reprinted below. CDC will present a one-hour webinar, 2018–2019 Recommendations for Influenza Prevention and Treatment in Children: An Update for Pediatric Providers, beginning at 2:00 p.m. (ET) on September 27. Part of its Clinician Outreach and Communication Activity (COCA) series, the webinar will feature subject matter experts from the American Academy of Pediatrics (AAP) and CDC. Presenters will discuss strategies primary care providers and medical subspecialists can use to improve flu prevention and control in children for the 2018–2019 season. The presenters will share AAP and CDC recommendations about influenza vaccination and antiviral treatment, including updated recommendations for the use of intranasal live attenuated influenza vaccine (LAIV4) in children. ACIP will hold its next meeting on October 24–25 in Atlanta. The draft agenda is now available online. To attend the meeting, ACIP attendees (participants and visitors) must register online. The registration deadline for non-U.S. citizens is September 26; for U.S. citizens, it's October 10. Registration is not required to watch the meeting via webcast or listen to the proceedings via phone. See the first link below for the toll-free phone number and passcode. FluMist: Reasonable Vaccine Option or 'Last Resort' for the Upcoming Flu Season? In this Medscape video commentary, Dr. Paul Offit, Children's Hospital of Philadelphia, discusses why live attenuated influenza vaccine (FluMist) should be used in 201819 interchangeably with injectable vaccine as ACIP recommends, rather than as a "last resort" as the AAP News headline described AAP guidance. Medscape login is required.